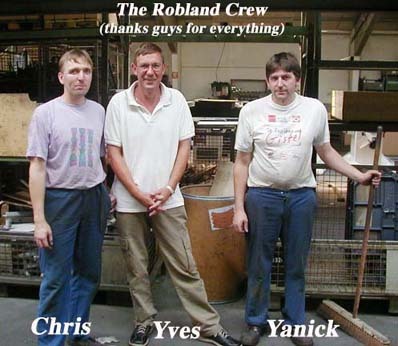 While in Europe this past summer (2001) I had the opportunity to visit the Robland factory in Brugge, Belgium. It took about a month to make arrangements for the visit - they don't allow people to just drop by. I phoned Yves Damman, the factory manager, from the Brugge train station and he picked me up and drove me to the factory. Talk about customer service - Yves was recovering from open heart surgery and about to go on a months vacation (a lot of Europe goes on vacaction for most of JULY!). He came in just to give me the tour. Yves showed me around the factory, making sure I saw their CNC plasma cutter. Put in a large sheet of 1/4 - 1/2" steel, push the button and come back later to a bin full of parts. Impressive machine. But I'd asked to see how the factory set up an X31. Yves took me over to meet Chris and Yanick. For the next four hours I got to watch and photograph how they set up six French model X31s. Fortunately they knew far more english than I knew Flemish, Dutch, French or German (they speak all these languages). Once they realized that I really wanted to know how they set up the X31 and was impressed with how quickly they did things that took me hours to do they tried very hard to show me all their tricks and tips and techniques. Click here to see how these guys set up six French model X31s.